I still have trouble running the demo successfully in any browser (I tried both Chrome and Firefox updated versions). I do get the microphone notification icon but nothing gets transcribed once I speak…. I tried using it both in Ubuntu (12.10) and Windows 8.1 with both Chrome (V42 64bit) and Firefox. OK, thanks. I’ll have to test it in other OSes. I just tried again, and no problems here on OS X. No errors shown in that log either, just normal debug messages. Any chance your microphone is muted at the OS level? That really should not be the case! Yeah, it should be identical across platforms. Not sure why it’s doing that, whether it’s a browser/platform issue, or issue in the code. I just checked it again in WIndows. Not working. New version posted. Should work in any browser supporting getUserMedia and .ogg for HTML5 Audio (Chrome and Firefox). Is it the same url? I still can’t get it to work in chrome/windows. I am running this without issue in Chrome on Windows. You sure your mic is working? I’m looking for a partner to develop some tools using Watson. Do you know anyone interested in joining a startup? Thanks Andrew – I really like this example, and was myself trying to combine these three fundamental Watson services into a similar demo. I have built apps leveraging the Q&A, and then I played with the Speech services. You have combined all three very well into a really good app. But I have two issues. 1. I demonstrated the Q&A healthcare service to a Doctor and had the Doctor ask questions and the results were apparently less than usable. How can the results be improved and how can a user feedback to Watson to improve the accuracy? Cognitive systems need some feedback so how is Watson getting this? 2. In my browser the mic does not record the speech very well. It is not capturing and converting what I say into the same question in text. It seems to be quite unreliable and inaccurate. Is this a fault of my browser, laptop mic or other? I am using Chrome on my WIndows Lenovo laptop. But many thanks for pulling this demo together – I really like it. Just a couple of things to build on. Hi Peter, Thanks for the feedback. 2: I think it’s a laptop/mic issue. I use an external mic, which seems to work pretty well, but the internal mic on my laptop does not work nearly as well. I’m sure the team is working on ways to improve extraction and dealing with low signals background noise, but I can’t say with any certainty b/c I am not involved with that team. Hi Andrew, I would like to start working on a two app ideas using Watson with Real Estate data. 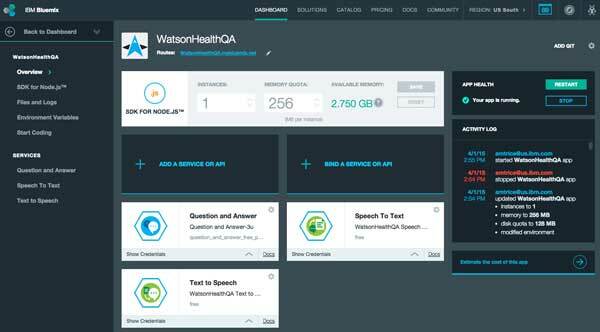 Right now Watson Q&A on Bluemix is only for Travel and Healthcare data. What steps can I take to get Real Estate data into Watson for my apps? Andrew – I thought you might appreciate an ATTA-BOY of recognition for the superb work and your (even better) attitude of collaboration. Thanks for creating the videos and sharing the tools. I’m a veteran web developer (since ’97), but on my first efforts with Bluemix. Thanks for heading me on this journey with some enthusiasm and naive confidence!